Definition at line 19 of file Mips16FrameLowering.h. Definition at line 39 of file Mips16FrameLowering.cpp. Definition at line 162 of file Mips16FrameLowering.cpp. References llvm::TargetFrameLowering::determineCalleeSaves(), llvm::MipsSubtarget::getInstrInfo(), llvm::Mips16InstrInfo::getRegisterInfo(), llvm::MipsRegisterInfo::getReservedRegs(), llvm::MipsFrameLowering::hasFP(), llvm::BitVector::set(), llvm::MipsFrameLowering::STI, and TII. Definition at line 91 of file Mips16FrameLowering.cpp. References llvm::BuildMI(), llvm::MachineBasicBlock::end(), llvm::MachineBasicBlock::getFirstTerminator(), llvm::MachineFunction::getFrameInfo(), llvm::MipsSubtarget::getInstrInfo(), llvm::MachineFrameInfo::getStackSize(), llvm::MipsFrameLowering::hasFP(), llvm::Mips16InstrInfo::restoreFrame(), spillCalleeSavedRegisters(), llvm::MipsFrameLowering::STI, and TII. Definition at line 42 of file Mips16FrameLowering.cpp. References llvm::MachineFunction::addFrameInst(), llvm::MachineFrameInfo::adjustsStack(), llvm::MachineBasicBlock::begin(), llvm::BuildMI(), llvm::MCCFIInstruction::createDefCfaOffset(), llvm::MCCFIInstruction::createOffset(), E, llvm::MachineInstr::FrameSetup, llvm::MachineFrameInfo::getCalleeSavedInfo(), llvm::MachineModuleInfo::getContext(), llvm::MCRegisterInfo::getDwarfRegNum(), llvm::MachineFunction::getFrameInfo(), llvm::MipsSubtarget::getInstrInfo(), llvm::MachineFunction::getMMI(), llvm::MachineFrameInfo::getObjectOffset(), llvm::MCContext::getRegisterInfo(), llvm::MachineFrameInfo::getStackSize(), llvm::MipsFrameLowering::hasFP(), I, llvm::Mips16InstrInfo::makeFrame(), MRI, Reg, llvm::MachineInstrBuilder::setMIFlag(), llvm::MipsFrameLowering::STI, and TII. 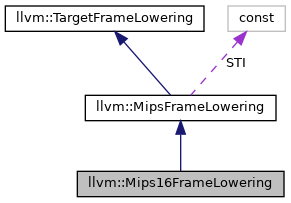 Definition at line 155 of file Mips16FrameLowering.cpp. Definition at line 140 of file Mips16FrameLowering.cpp. Definition at line 113 of file Mips16FrameLowering.cpp. References llvm::MachineBasicBlock::addLiveIn(), llvm::MachineFunction::getFrameInfo(), llvm::MachineBasicBlock::getParent(), llvm::MachineFrameInfo::isReturnAddressTaken(), RA, and Reg.